Soukha Kachittavong shoved all in from the cutoff for 575,000. 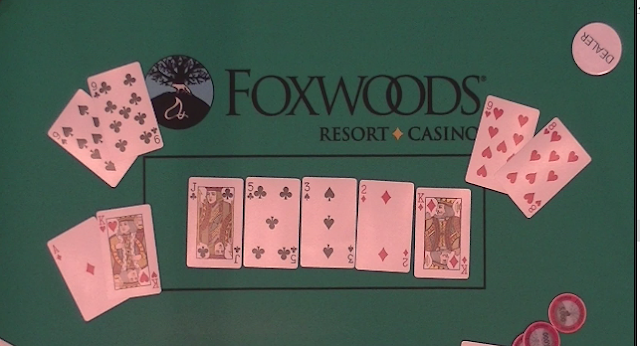 Michael Bissonnette re-shoved over the top for 1,125,000 from the small blind. Mike Borchetta went into the tank and said, "How can I fold this hand twice on the same final table?" After two more minutes of thinking it over he called. The flop came [jc][5c][3s] leaving Kachittavong in the lead. He maintained that lead when the turn came the [2d]. But when the [kd] hit on the river, Borchetta would win the hand and eliminate both Kachittavong and Bissonnette. According to the chop deal between the final five, Kachittavong took home $5,430 and Bissonnette took home $5,000. They are playing it out for the trophy. David Kluchman raised to 125,000 in the cutoff. Joseph Bezjian shoved all in from the small blind, and Mike Borchetta reshoved over the top. Kluchman thought for a moment before calling. The board ran out [3c][qs][kc][2s][5c], eliminating Bezjian in 6th place. Chris Macneil shoved all in on the button and was called by David Kluchman in the big blind. The board ran out [jc][8s][7d][6s][ks], sending Macneil home in 6th place, and chipping Kluchman up to 3,250,000. Kluchman is the current chip leader of the table. Marie Johnson shoved all in from under the gun and Chris Macneil called in the small blind. The board ran out [5h][2s][8s][qh] sending Johnson home in 8th place and chipping Macneil up to just under 900,000. At 10,000/20,000 blinds with a 3,000 ante, a player in middle position raised to 45,000, the player on the button called, and Mike Borchetta shoved all in from the small blind for 145,000 total. The original raiser in middle position reshoved over the top, and the player on the button hesitantly folded. The board ran out [js][8d][2c][3c][6d] awarding Borchetta the pot. He is now sitting with 300,000 in chips. Two players were knocked out at the same time to officially break the money bubble in Event #8. Ronald Lockwood and William Matsen will share the 21st place prize and each take home $316.00. A player in middle position raised to 3,000, the player in the cutoff called, and Janice Delaney called in the small blind. 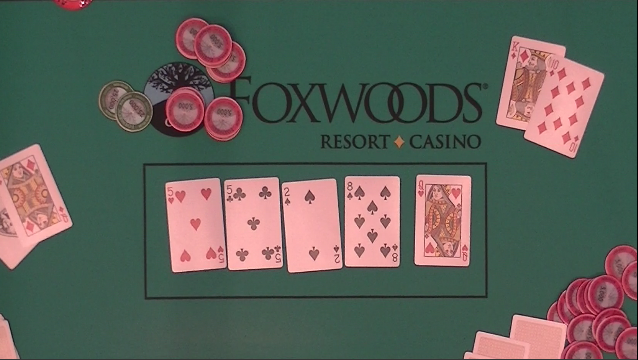 Delaney checked the [kc][9d][7d] flop. The player in middle position bet 3,000, and both players called. All players checked the [6d] turn. Delaney checked the [4h] river, the player in middle position bet 3,000, the cutoff folded, and Delaney called. Delaney turned over [7c][5d][3c][2d] and announced with a sigh, "I have a flush and a two-three low." The player in middle position mucked his card and said, "You sounded so disappointed,"
There were 54 entries in today's $300 HOSE event, generating a prize pool total of $13,619. There were 179 entries in today's $300 NLH Big Stack event, generating a prize pool total of $45,143. The $25,000 guarantee, $300 NLH big stack event has just started the second level. There are already 82 runners in this event. Registration is open until the start of level 11. After battling it out with Jeff Miller heads up, Jason Calnan would take the title of Event #5 champion, the $19,778 prize money, and the trophy. Calnan was victorious after the final hand when he got it in with [qc][qd] vs. [qs][9d] and the board ran out jack-high rainbow.